Evo & RST’s ‘Life’ (Non Lamentar mix) has been selected yet again for Germany’s premier compilation label – Recovery House. 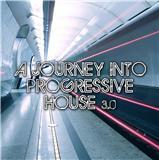 A Journey Into Progressive House Vol 3.0 perfectly blends 27 prevalent tracks including joints from Aphrodisiac, Swanky Tunes & Tune Brothers. Worldwide digital release on Beatport, Amazon, itunes & all good leading digital stores: 07.07.11. This entry was posted in Uncategorized and tagged carte, evoandrst, house, international, life, ministry, nikki, techno. Bookmark the permalink.